I saw this cute granny square tree ornament and just knew I had to try it. 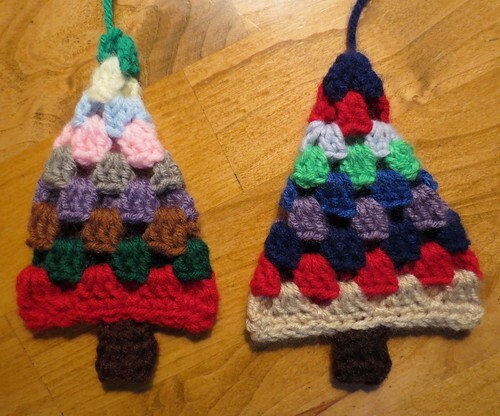 The tree on the right was the first one I crocheted. I had trouble with the pattern and couldn’t get my stitch counts to come out to match the pattern. So I improvised and did my own thing to get the tree to come out looking okay. I reached out to the pattern designer Squibbly Bups for the Granny Christmas Tree pattern to figure out the pattern as written. I heard back from her and found out she counts the Ch-1 as stitches so that is why I was off on my stitch counts. I re-worked the pattern which is the tree ornament on the left. I also changed up the base of the final row on the tree to just work single crochet stitches evenly along the base before starting the trunk. For the trunk I chained 8 and worked 3 rows for the trunk on each of my trees. With only 2 rows, the trunk was too small for my liking. Final thoughts – overall a very cute crocheted Christmas tree ornament! © 2018 My Recycled Bags.com - Powered by Wordpress.